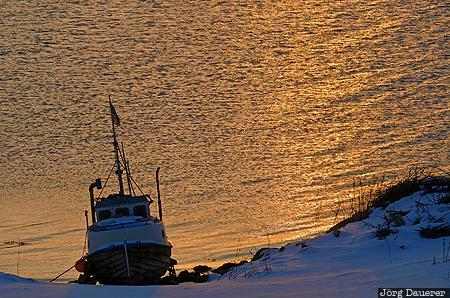 A lone fishing boat at the snow covered coast of the island Hinnøya in front of the Norwegian Sea back-lit by a colorful sunset. The island Hinnøya is part of the Vesterålen archipelago, Troms, Norway. This photo was taken in the evening of a sunny day in March of 2013. This photo was taken with a digital camera.